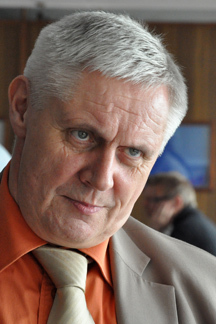 Professor, Dr. Per-Edvin Persson, (b. 16.10.1949 Helsinki), Master of Agriculture and Forestry 1974 (University of Helsinki), Doctor of Agriculture and Forestry 1981 (limnology, University of Helsinki), Adjunct Professor of limnology, University of Helsinki, 1981-. Professor by decree, President of Finland, 2011. Doctor of Philosophy honoris causa, University of Helsinki, 2014. 1975-1983 research scientist at the University of Helsinki (including passages on Academy of Finland grants and a fellowship year in Canada 1977-78), 1983 – 87 Director of the Federation of Finnish Scientific Societies, 1987 – 91 Director of Science at Heureka, the Finnish Science Centre, and 1991 – 2013, Director of Heureka. He has written about 50 scientific publications, 200 popular articles, been editor of 4 scientific monographs, including numerous articles on science centres and museums. He has held numerous national and international positions of trust, including membership in the Finnish Research Council of Environmental Sciences 1983 – 88, Nordic Science Policy Council (Copenhagen) 1986 – 91, Governing Board of the Academy of Finland 1992 – 94, Vice Chair of the Board of the Finnish Game and Fisheries Research Institute 1984-2011, Chair 2012-14, chairman of the IAWQ Specialist Group on Tastes and Odours 1984 – 91, chairman of seven international scientific conferences in Finland, Japan and USA 1980-1991, Board Member of the education association Svenska folkskolans vänner 1989-2010, Chair 2010-2017. He was elected member of the Swedish Academy of Technology in Finland in 2007 and of the Finnish Academy of Technology in 2010. Professor Persson was President of the Nordic Science Centre Association (NSCF) 1987-1991, President of the European Science Centre network ECSITE (Brussels) 1997-1998 and President of the international branch organisation Association of Science-Technology Centers (ASTC), based in Washington, D.C., in 2004-2005. He served on the ECSITE Board 1991-2001, and again in 2007-2013. He served on the ASTC Board in 1993-2007. He served as Chairman of the First Science Centre World Congress in Finland in 1996. He served on the Programme Committee of subsequent World Congresses (Calcutta, 1999, Canberra, 2002, Rio de Janeiro, 2005, Toronto, 2008, Cape Town 2011). He served as Chair of the ReDiscover Fund Advisory Board in the UK in 2002-2005. He was a member of the international evaluation group of La Cité des sciences et de l’industrie in Paris in 2001 and the International Scientific Advisory Committee of the New China Science and Technology Museum in Beijing in 2006-2009. He was a member of the Kuratorium of the Deutsches Museum in 2002-2014, a member of the Science Council of the AHHAA Science Centre in Tartu, Estonia 1998-2015, of the Science Advisory Board of the Swedish Museum of Technology 2009-2015, and of the Steering Group of the Norwegian Science Centre Programme 2011-14. Under his leadership, Heureka, the Finnish Science Centre developed into a science centre of international renown. Heureka is well-known for its innovative and highly interactive science exhibitions that have circulated in 25 countries in four continents and that have been seen by more than 24 million visitors during the period 1989-2013. Heureka is one of Finland’s top attractions. – Professor Persson has received, inter alia, the Finnish State Prize of Information in 1987 and in 2014, the Oskar von Miller medal in gold from Deutsches Museum in 2002, the Medal of the City of Tartu in 2007 and the Medal of the City of Vantaa in 2009. He was given the ASTC Fellow Award for Outstanding Contribution in 2007 and was elected Honorary Member of ECSITE in 2013 and of NSCF in 2015. He received the ASPAC President’s Award for his contributions to the Asia Pacific Network of Science-Technology Centres in 2014. He is Knight (1st grade) of the Order of the White Rose of Finland and Knight of the National Order of Merit (France).